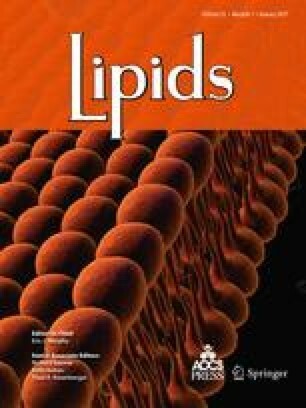 The protective effect of phenolic compounds from an olive oil extract, and of olive oils with (extra-virgin) and without (refined) phenolic components, on low density lipoprotein (LDL) oxidation was investigated. When added to isolated LDL, phenolics [0.025–0.3 mg/L caffeic acid equivalents (CAE)] increased the lag time of conjugated diene formation after copper-mediated LDL oxidation in a concentration-dependent manner. Concentrations of phenolics greater than 20 mg/L inhibited formation of thiobarbituric-acid reactive substances after AAPH-initiated LDL oxidation. LDL isolated from plasma after preincubation with phenolics (25–160 mg/L CAE) showed a concentration-dependent increase in the lag time of conjugated diene formation after copper-mediated LDL oxidation. Refined olive oil (0 mg/L CAE) and extra-virgin olive oil (0.1 and 0.3 mg/L CAE) added to isolated LDL caused an increase in the lag time of conjugated diene formation after copper-mediated LDL oxidation that was related to olive oil phenolic content. Multiple regression analysis showed that phenolics were significantly associated with the increase in lag time after adjustment for effects of other antioxidants; α-tocopherol also achieved a statistically significant effect. These results indicate that olive oil phenolic compounds protect LDL against peroxyl radical-dependent and metal-induced oxidation in vitro and could associate with LDL after their incubation with plasma. Both types of olive oil protect LDL from oxidation. Olive oil containing phenolics, however, shows more antioxidant effect on LDL oxidation than refined olive oil.